Bottlenose dolphins (Tursiops truncatus) have a relatively short beak and a high, with a hooked and prominent dorsal fin. They are dark or light grey on the back grading to white on the undersides, although their colour and shape can be variable. The size of a newborn is around 85 cm - 1.3 m in length, and an adult 1.9 - 3.9 m.
Bottlenose dolphins are particularly susceptible to human impacts due to their coastal nature. Bottlenose dolphins, Doubtful Sound. Photo: S.Hayes. Bottlenose dolphins are widely distributed throughout the world in cold temperate and tropical seas and generally do not range poleward of 45° in either hemisphere. New Zealand is therefore at the southern most point of their range. Limits to the range of this species appear to be temperature related. They are found both offshore and in many enclosed areas such as the Mediterranean, Black and Red Seas. Population densities appear to be higher close to shore, where these dolphins tend to travel in groups of about 30 individuals. Two global ecotypes have been recognised: those living in pelagic or open ocean environments and those living in coastal areas. Population sizes are largely unknown but this species is relatively common worldwide. Another group range from the Marlborough Sounds to Westport. Bottlenose dolphins are commonly associated with other cetaceans including pilot whales, rough-toothed and Risso’s dolphins, and humpback whales. Individuals living close to the shore feed primarily on a variety of inshore bottom-dwelling fish and invertebrate species. Those offshore feed on mid-water fish species and oceanic squid. Their dives rarely last longer than 3-4 minutes inshore, but may be longer offshore. Individual feeding appears to be the most prevalent foraging method but individuals are also known to work together to herd schools of fish. Females tend to reach sexual and physical maturity before males, leading to sexual dimorphism in some regions. Females usually reach sexual maturity at 5-13 years with males not maturing until 9-14 years of age. Females breed every 3-5 years and calves suckle for around 2-3 years. Calving peaks are known to occur for most populations between spring and summer/autumn. Female bottlenose dolphins can live up to more than 50 years of age, and males can reach as old as 40-45 years. Sharks are probably the most important predators of bottlenose dolphins with the numerous shark-bite scars found on as many as half of all bottlenose dolphins providing evidence of such encounters. Killer whales are also likely to be one of the main predators. Bottlenose dolphins are particularly susceptible to human impacts due to their coastal nature. In New Zealand, the main threat to this species is likely to be the adverse effects of tourism. Bottlenose dolphins are the focus for dolphin watching in the Bay of Islands and Fiordland areas. Studies have found the presence of boats to interfere with dolphins’ normal behaviour and boat strike in areas of high boating activity is always a threat. Common sense rules should therefore apply when boating around dolphins to reduce stress on the animals. Such rules are outlined in the Marine Mammal Protection Regulations (1992). 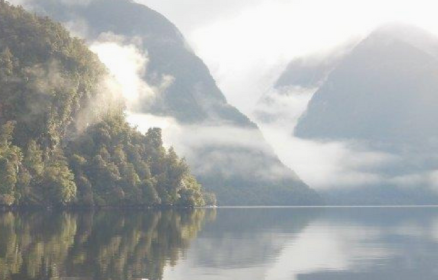 We use photo-identification to monitor the population ecology of this species in Fiordland and the Bay of Islands. The impacts of tourism at these two sites is also currently being assessed, and in order to minimise disturbance to the animals this industry will need to be carefully managed. We are also responsible for managing stranding events. Moko was a male dolphin that visited the coastline around Mahia and the Bay of Plenty. There are some places in life that you need to see, feel, touch, and smell to truly grasp their beauty, wonder and awe. Dusky Sound is one of those places for me.